This post is a contribution to a series leading to ASPI’s Future Surface Fleet Conference  at the end of March. Sam Bateman’s recent post  identified problems with our national commitment to the Antarctic and the Southern Ocean. He was particularly concerned with our lack of seagoing capability for the region and the apparent absence of a coherent approach to Australia’s maritime security requirements. In particular, he emphasised the need for a ‘national fleet’. The concept of a National Fleet can work at several levels. At its most comprehensive, it means that the capabilities, acquisition, life-cycle management and operations of all national government ships are managed in such a way as to minimise the total costs and allow the most effective use of a country’s shipbuilding and maintenance resources. That’s an inviting ideal, but not one without complications—as the Canadians  have discovered . Many of the elements of a National Fleet are so specialised in design and construction that it’s extremely inefficient to produce them in small numbers. And Australia has, in any case, ‘missed the boat’ on achievement of a National Fleet concept for shipbuilding on this scale. Recent purchases of civilian support craft for the Navy and the construction of a new research vessel for the CSIRO and the replacement Antarctic support ship in overseas yards have accounted for a good part of the nation’s civil requirement for the immediate future. But applying a National Fleet approach to the allocation of capability between departments is worthwhile and that was Sam’s focus. He identified a key problem with two components. The first is a question of the total national effort in civil maritime security and the second concerns the division of deep-water capabilities between civil and military agencies. Neither’s right at the moment, particularly in relation to offshore patrols. Australia’s contemporary deep-water maritime security threats and challenges have two widely separated focal areas. They’re to the north-west of the continent in the vicinity of Christmas Island and in our Southern Ocean and Antarctic waters. Both tasks need big ships, by reason of the environment—and distances involved—and because of their likely employment. There’s currently only one major civil security ship in service that can operate in both regions, the Ocean Protector. A second unit, the trimaran Triton, has some utility for the north-west, but her lease is coming to an end. There’s no planned replacement. Ocean Protector’s sister ship, Ocean Shield, is being transferred to the Department of Immigration and Border Protection (DIBP) from Defence in a sleight of hand devised when the last Labor government was desperate to save money, needed to acquire a temporary disaster-relief capability in the form of Ocean Shield and didn’t wish to have to renew Ocean Protector’s lease. Meanwhile, Navy has been forced to provide additional support in the north-west with amphibious vessels, survey ships and surface combatants. 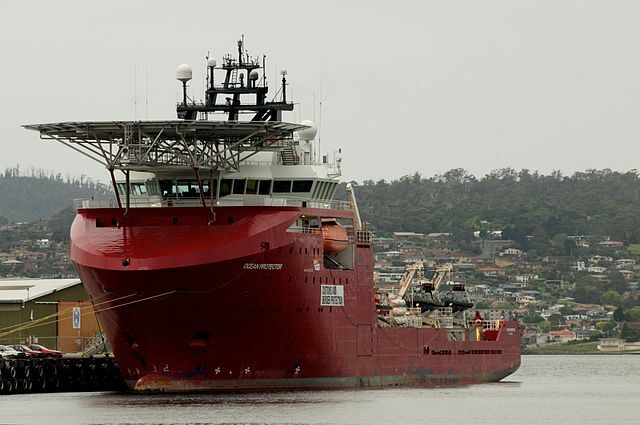 Even that commitment hasn’t been enough in recent years to allow DIBP to resume on any regular basis the Southern Ocean deployments for which the first big vessel (Oceanic Viking) was leased by then-Customs in 2004. Excessive employment of major naval units on maritime security tasks can have serious long-term effects. If they’re survey vessels, then inevitably the national task of hydrographic survey of Australia’s coasts and key shipping routes will be affected. For the amphibious forces and surface combatants, there are effects on training and readiness. Ships deployed on solitary patrol work can’t be exercised in complex warfare scenarios—or even many of the lower-level operations which require interaction with other units. Many of those skills degrade over time and become progressively more difficult to reconstitute as personnel move through the system and hard-won experience leaches out. There’s also the reduction in availability for alternative operational employment. In peacetime, that mightn’t overly concern governments, since many of the missed opportunities for defence engagement and higher-level training don’t have direct political results, even if their cumulative effects can be profound. But the chickens can come home to roost quickly in an emergency. That’s not an argument for completely removing the civil maritime security task from Navy. The civil–military combination which operates in Border Protection Command provides great flexibility, particularly because of its ability to call on the ADF for additional resources when situations demand. The RAN’s patrol boat force complements the increasingly capable but smaller DIBP’ force. Maritime security calls out for the right balance. Additional ships are required in the Australian inventory capable of dealing with large numbers of would-be immigrants and of operating in the harsh conditions of the Southern Ocean and the Antarctic. Most of all, for the demands of the north-west patrol, Australia needs at least another large vessel on strength and sooner rather than later. That would relieve pressure on the Navy, while allowing DIBP to increase its southern patrols. In the longer term, a second, fully ice-capable ship, in addition to the vessel being built to replace Aurora Australis, should be acquired to allow Australia to sustain a much more effective presence in Antarctic waters. To which agency should the government allocate these big ships? Clearly, they should go where they provide the best value for money. For me the dividing line doesn’t relate to as much to size, speed or endurance, as to the sensor and weapon fit. Anything fitted with more than simple electronic intercept gear and search radars, together with light weapons and their associated aiming gear really belongs to the Navy. Sophisticated systems of that nature are expensive and involve substantial overheads in training and support. Most importantly, they also provide significant military capability which the government should be able to utilise in higher-intensity conflicts. Still, size does matter and there are usually advantages to keeping the bigger vessels under naval control, since they have military potential in other ways. In the case of reinforcement for the north-west in the short term, the additional ship would best be allocated to DIBP. Who takes on the Antarctic will need separate and careful consideration, as an element in developing a comprehensive and long term approach to the division of capability between DIBP and the Navy. This should be central to the considerations for replacement of the Armidale class. James Goldrick is a fellow of the RAN’s Sea Power Centre and an adjunct professor at UNSW Canberra, Australian Defence Force Academy. Image courtesy of Wikipedia .